The fleece fabric on this jacket has a good abrasion-resistant finish on the outside, while on the inside it’s quite fluffy to add more warmth. The hood was the best fitting out of the fleece jackets that I have used too, and so overall it feels very comfortable and ideal to wear as part of a layering system. However it is quite a lightweight fleece, so its use is limited to that of a mid layer in warmer weather. On cold days or for winter in Scotland I’d need either a thicker main insulation layer or an additional insulation layer to stay warm. I also noticed the wind driving through this layer easily. The price makes it feel like a luxury for something that won’t keep you warm year-round. 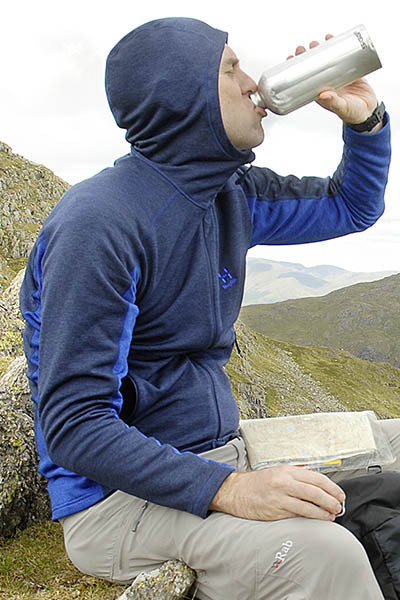 But this lightweight fleece is ideal for walking in the UK from late spring through to early autumn. Price, weight, packed size, great hood, works well as a warm-weather mid layer. Not warm enough for colder spring or autumn days and so extra layers will be needed regularly and more so in winter. You want an excellent fleece jacket for walking in warmer conditions. Polartec Alpha insulation has a core of lofted knit fibres, so it traps more air than fleece, and offers far more insulation, which makes it ideal as an additional layer to throw on over other layers when the temperature dips. It’s also exceptionally breathable, therefore it works well under waterproof layers. This jacket also gets stretch side panels, giving it a closer fit than other jackets and again making it ideal as part of a layering system. I also liked the way the hood fitted and moved with my head. It’s not the warmest option though. Yes it is great as an additional layer when moving, which is what it is designed for, but when sitting around I’d need extra insulation on colder days. It’s not that windproof either, so expect to need a wind or waterproof shell over the top to stay warm. Weight and packed size, price, great hood, works well as part of a layering system when moving. Warmer than fleece, but you’ll need extra insulation in cold weather, especially if not moving. You want extra insulation to wear as part of a layering system while moving. A new jacket using very efficient 850 fill power down, which ensures you get an extremely low weight. But importantly you also get synthetic Coreloft insulation in areas that may collect moisture, which would impact on the down performance, so this is placed on the cuffs and shoulders and also at the top of the front zip. Another huge benefit of this jacket is that you get rear cord volume adjustment on the hood, so it fits really well and moves effortlessly with the head. There is a hem drawcord too – a feature many jackets lack. You also get two main pockets. The main drawbacks are the price and it’s not quite the warmest option. But if you can afford it (and another jacket for colder winter days) this is a great jacket for year-round use. Weight and packed size, warm enough for mild conditions, great hood, additional synthetic insulation. Price, not quite warm enough in winter, no cuff adjustment, slightly short body compared to others. You want a very lightweight insulated jacket for spring to autumn and on the mildest winter days. This is a modern, practical fleece jacket, but is it warm enough to beat the chill you’ll experience at the lofty heights of a mountaintop lookout? The Privitale is an immensely comfortable and warm jacket at a great price for what you get. Its stretch polyester fleece fabric has a tight knit on the outside to improve wear, while inside the looser knit increases warmth and comfort. The fit is close but as the fleece is very stretchy it does not restrict movement. The hood is particularly well-designed with a close fit, and turns with the head easily. The baffle behind the zip, long sleeves with thumb loops and generous back length protected my 6ft 2in body well to keep out draughts and retain body warmth. A great benefit over many jackets is that the pockets are large and easily accessed while wearing a rucksack. Also as fleece is very breathable this works great under a waterproof jacket as part of a layering system. The Privitale is versatile enough to be worn over a base layer and under a waterproof jacket, so it can be used as your main insulated layer or as back-up insulation. Whilst I’d be happy with this as my only mid-layer on most hill days, I’d still want something a little warmer and with more wind resistance, such as a down or synthetic insulated jacket, for back-up in autumn or winter, particularly for camping on the hill or for bothy nights or for really snowy Scottish mountains days. While I like the price tag, I’d be happy to pay a few extra pounds for a hem drawcord to lock out drafts and retain the great fit if I was lucky enough to lose a few pounds in weight on a trip. But the main drawback here is the weight and bulk of this jacket compared to warmer jackets, as any back-up jacket that is spending much of the day in the rucksack needs to be as light and compact as possible, and others are better in this department. Sadly there is no women’s option either. For me it’s the perfect mid layer, providing reassuring warmth and ease of movement at a great price, but others are lighter and offer more weather resistance. Does the latest Primaloft Thermoplume insulation make this jacket ideal for taking on the hill when extra warmth is needed at a reasonable price? New for 2018 and made from the latest Primaloft Plume insulation, which is said to offer similar levels of performance to 550 fill power down. Not surprisingly perhaps, this was very warm – in fact the warmest jacket we tested. The outer Pertex Quantum Eco nylon shell fends off wind and moisture well, and is also reasonably breathable so you don’t get sweaty. This jacket feels pretty warm and cosy, with a good length, well-insulated hood, and elasticated cuffs and hem to lock out draughts. The two main handwarmer pockets are well placed to allow access even when a rucksack is worn, and there’s a third useful GPS receiver-sized zipped chest pocket. 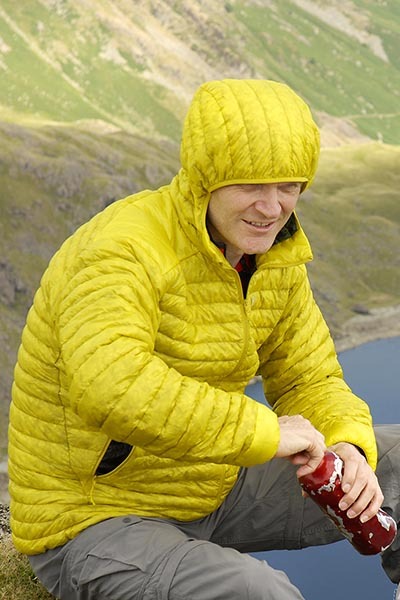 So this jacket is ideal for stopping for a brew on the hill or sitting around a bothy or campsite, with the added bonus that the synthetic insulation won’t be impacted by dampness as much as a down jacket. It’s as warm as a down jacket too, but with a far less chilling price. It costs more than a fleece and is quite heavy and bulky too. So while great in terms of warmth, you may think twice about carrying it regularly in your rucksack. It’s not as breathable as a more open-knit fleece either, so isn’t so great for walking with. Also, while the fit was good, the hood doesn’t move quite as well with my head as the hoods on some other jackets, and the cuffs didn’t fit as neatly as they could. As there is no Velcro adjustment on the cuffs there is no way of tightening or loosening the fit here to allow the cuff to fit over gloves. The hem is elasticated, but again has no additional adjustment. This jacket is great in terms of warmth but it could be too warm for mild autumn days, so with its extra weight and bulk this is one for colder days only. Great for stopping out on a cold, British winter mountain, with a price that’s more attractive than a down equivalent. But the weight and packed size are drawbacks. Down insulation is extremely efficient, so is this lightweight jacket the best option for stashing in your rucksack as a back-up jacket? The use of 700 fill power down inside this jacket ensures that it is very lightweight. It also packs down small, and both of these features make it great for stashing in a rucksack just in case you need it on the top of the mountain. 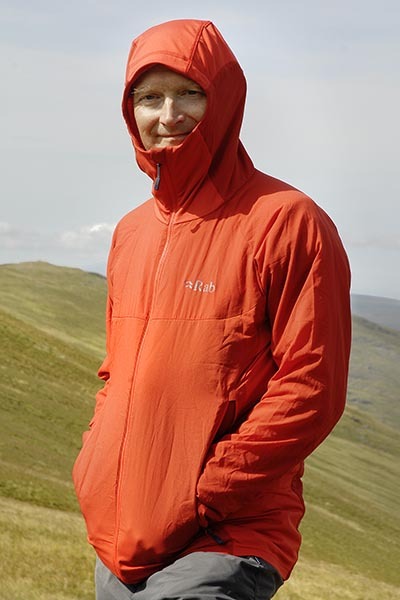 The level of insulation is less than the heavier, synthetic Montane jacket featured here, but more than fleece, making this a great general-purpose jacket for autumn and spring. And for me it is just about warm enough for mild winter conditions too. The outer is a lightweight Helium 20 nylon which fends off wind better than fleece and keeps some moisture away from the down. The hood and cuffs are only elasticated, but you do get a hem drawcord so you can fine-tune the fit more easily than some others. There are just two main pockets and these are placed low to make them good for hand-warming. The price is also more attractive than some other down jackets you could consider! For the depths of winter you may need something even warmer if camping in snow or sitting around for long periods high on a snowy mountain. 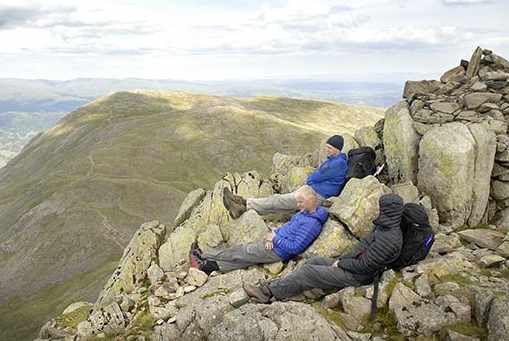 As the Arete uses down, lots more care is needed to ensure this jacket stays dry, as its insulating performance drops off dramatically if it does get wet. Also, of course, this is not as breathable as a more open knit fleece, so it’s not one for wearing while walking. While the fit is okay, the hood disappoints in this area and did not turn easily with my head. Also some adjustment on the hood and cuffs would be a real benefit. The pockets are okay, but again on other jackets these are placed higher or are bigger or there is a third chest pocket. There are some niggles with this jacket and you can get lower-priced fleece or synthetic jackets if cash is tight. Ideal for stowing in a pack year-round just in case it gets chilly, but some lower-priced jackets are warmer or perform better if damp.